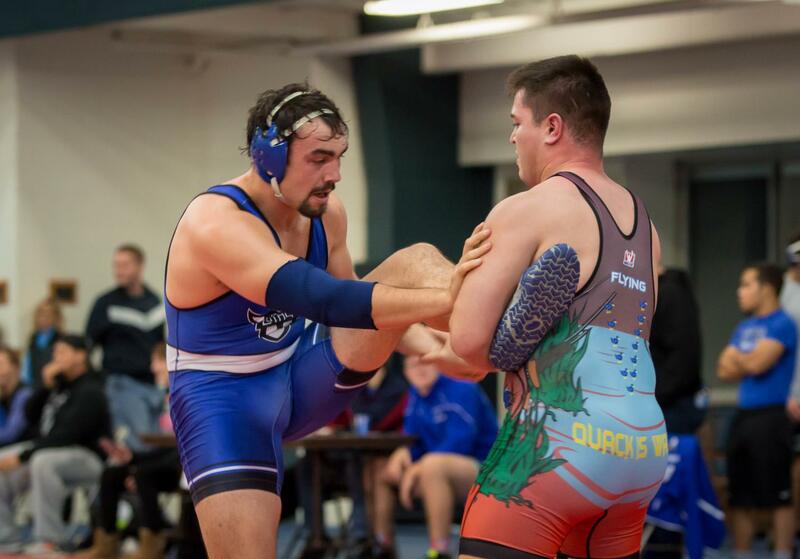 Gilbert Valadez (‘19) competed in a match against Wartburg College last season on Jan. 13, 2018. 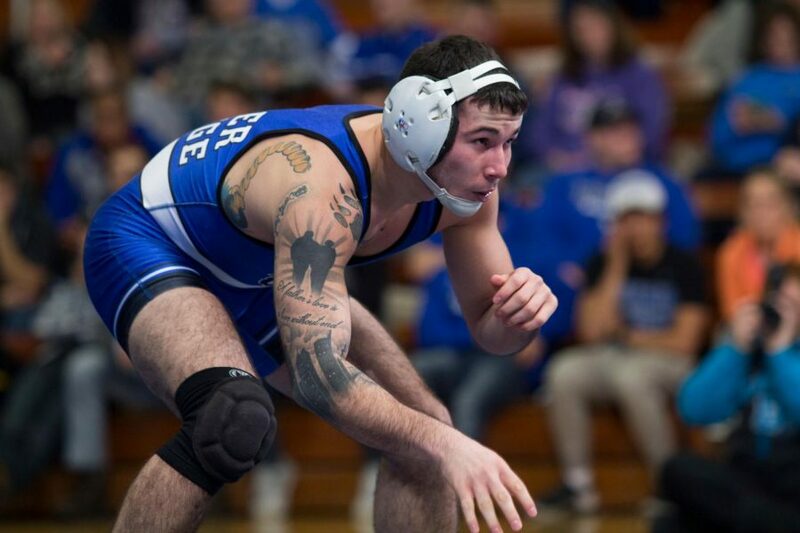 Luther Wrestling began their season by hosting the Luther Open in the Regents Center on Saturday, Nov. 10. No team scores were recorded for this meet. 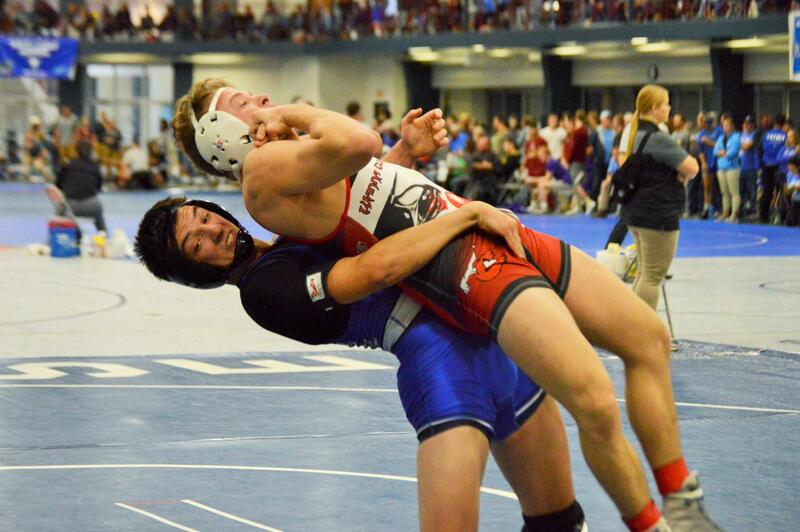 Nationally ranked teams from NCAA I, II, and III competed in the Luther Open. Unattached wrestlers from the University of Wisconsin-Madison, who are ranked 18th in NCAA I, participated in the meet, while eighth ranked in NCAA II Minnesota State University-Mankato also attended the Luther Open. Additionally, three teams ranked in the top 10 for NCAA III were at the Luther Open, including number one Wartburg College, seventh ranked Coe College, and eighth ranked University of Wisconsin-Whitewater. Before the tournament Head Wrestling Coach Dave Mitchell did not set any specific expectations, but instead hoped Luther wrestlers would focus on their technique and work hard. “If we’re battling all the time, we’re going hard, and we’re executing the things that we covered, I’ll feel really good at the end of the day,” Mitchell said. Hunter Weaver (‘20) wrestling in the Alumni Intrasquad Meet last season on Nov. 5, 2018. In the elite division Gilbert Valadez (‘19) and Ira Kuehn (‘21) both finished third in their respective weight classes. Valadez finished the 149 weight class with a tournament record of 3-1, and won the third place match with a score of 5-2. Valadez’s one loss came against Josh Gerke of Coe College in an 8-4 decision. Kuehn, who competed in the 184 weight class, was 2-1 in the tournament. Kuehn lost in the semifinals with a score of 7-3, but ended the Luther Open in third after Coe College’s Bryce Scott defaulted due to an injury. Additionally, Hunter Weaver (‘20) came in fourth place in the elite division’s 197 weight class, after losing both the semifinal and third place rounds in a 5-2 decision. In the silver division, Tyler DiFiore (‘22) and Tanner Weaver (‘22) both placed fifth, with DiFiore competing in the 133 weight class and Weaver in the 165 weight class. DiFiore’s one loss came in the second round in a 4:07 fall, but he won the fifth place match in a 10-1 majority against Taylor Fleetwood of Wartburg College, while Tanner Weaver pinned Cornell College’s Colin Honderd at 2:01. Jake Nadeau (‘22) competing at the Luther Open on Saturday, Nov. 10. Teagen Miller (’22) and Logan Kennedy (‘21) also placed in the Luther Open. Miller finished the 157 weight class in third place with a 11-2 majority over Joaquin Bautista of Wartburg, while Kennedy finished second after losing in the title match of the 285 weight class in a 0:08 fall. Moving forward, Mitchell hopes the team can improve to the level of two years ago where Luther placed third at the 2017 NCAA III Wrestling National Championships. Luther’s next meet will be at second ranked in NCAA III Augsburg College in Minneapolis on Saturday, Nov. 17.